These are my definitions (unless linked to other authors). They are all also hyperlinked to blog posts, other pages on this site, or elsewhere in cyberspace. Warning some may attempt humour. Badges: Meant as a way to gain “credit” for certain competencies, it does not appear that traditional degrees yet have much to fear from badges earned online. It is early, things may change. For the time being however, badges seem, to me at least, like continual professional development or evidence of commitment to developing skills which should carry some weight as well. Can also be referred to for certain "Widgets as in a twitter widget for your blog to display content from elsewhere by embedding with HTML programming code. Blogs: A website format often used for sites using regular updates. All blogs are websites but not all websites are blogs. You might be surprised by how many are blogs, however. NOTE: The regular updating that goes along with blogging improves search engine results. Bloom’s Taxonomy of High Order Thinking: An influential theory of learning now upstaged for the digital age. Branding: Figuring out what it is that you want to be known for and then actively seeking to promote yourself so that when others go looking for information about your “thing” they will be (ideally) inundated with search engine hits referring to your digital presence in the world. Tweets, blog posts, facebook postings, you name it. Be careful what name you choose because once you have been branded for a while it becomes wasteful to change, as all of your hyperlinks out there won’t be associated with your new name. 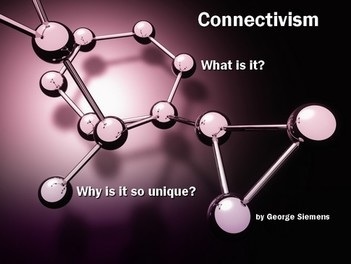 Connectivism: “…the connections that help us to learn more are more important than our current state of knowing.” This George Siemens quote sums it up nicely for me. Click the link to learn more from the master. Constructivism: We all construct our own knowledge and understandings in a social context. Copyright: A legal protection of creations, images, and other published works and intellectual property. Creative Commons: Develops, supports, and stewards legal and technical infrastructure that maximizes digital creativity, sharing, and innovation (cited from link). Cybespace: Where digital sharing lives. A series of interconnected servers worldwide housing information. Cyber Bullying: An old thing in a new way. Passing a note in class with an unflattering picture of a friend is so old school. Now you can tweet it or put it on facebook where it is much more public, and potentially permanent. Digital-age learning: It's about sharing, collaboration, self-directed, meaningful action, integrating technology in order to enhance learning and do new things.It is about creation. Working without boundaries of space. It never stops growing and changing. It is about sharing and building on the work of others. Would you want your grandmother to know you said/did that? How about a future employer? By remaining aware of the permanence of action in cyberspace you can manage your presence “out there.” You cannot control what other people say about you but you can say and do and share so many positive things that there hits will never make page one of a Google search. (BTW, I have heard it said that page two of a Google search is the best place to hide a dead body. Just in case you should need to know). Digital Profile: What you tell people about yourself. Most sites you can join ask you to share about yourself. If you trust the site then you can let people know more about you, become more connected and brand yourself effectively. Digital Storytelling: Everything is narrative. By learning how to use digital tools highlighted on this site and reading the insights shared by others you can become a more effective communicator, be it online or in the classroom. Embed: To use HTML to showcase other creations out there in cyberspace. Embedded standards: Theuse of standards for technology integration in your planning across the curriculum. Flat Classroom: The practice of using global collaborations to "flatten" the globe and collaborate with others anywhere. Fair Use: How to use the work of others in remixes, mashups, blog posts and more, ethically & legally. Flipped Classroom: Using web 2.0 tools to offer instruction off campus so the classroom becomes a lab for exploring, extending and applying under the supervision of an expert facilitator. Game Based Learning (MOOC): learn while doing and incorporate design elements. Google Apps for Education: A great way to share and save your creations. Collaboration is an essential skill in the digital age. Google Reader: A way of trying to manage all your RSS feeds (see below). There is so much information out there. We need tools to streamline. Hyperlink: A piece of digital (online) text that links you somewhere else in cyberspace. It may open in the same window (view) or another one. Some do not allow you to return to the previous page (very sneaky in my books). Infographic: An image devised to make a complex explanation simple. LMS, Learning Management System (ex: Moodle): A site designed to manage learning experiences based on perissions. Some have access to view (guests), some to participate (enrolled students) and others to alter (teachers and administrators). MOOC: Massive Open Online Course. Free. Accessible from anywhere (wired). I love the entire idea of these courses. There is an ever-expanding list of institutions offering free courses online (often with a short processing fee). Moodle (Modular Object oriented Dynamic Learning Environment): A free LMS. NETS (National Educational Technology Standards) for Students and Teachers: Free standards to use in planning offers by the International Society for Technology in Education. Netvibes: A way of managing your RSS feeds. Network: A system of connections. It can be the connectivity of technology at your school or the connections you have made through different groups and people through a Personal Learning Network that helps you keep on top of trends in education (or anything else for that matter). PLN, Personal Learning Network: A system of connections you have made through different groups and people through that helps you keep on top of trends in education (or anything else for that matter). Social Network: Think Facebook. There are others but this gives you the idea. A place to maintain connections to other people. There are costs as your personal information becomes more accessible and there are privacy issues. Reverse Instruction: Part of the Flipped Classroom. Teaching and learning takes on a different form from the traditional classroom. RSS, Really Simple Syndicate:A way of signing up to be automatically alerted to updates on sites you select. RSS Reader: A tool for (trying to ) keep track of what you have opted to RSS feed yourself. Standards: The bits of a rubric that tell a student how well they have done. 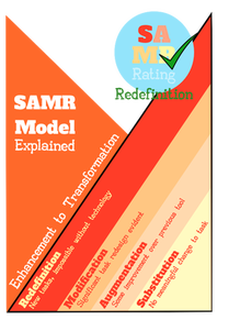 Technology Integration: Planning how technology will be taught across the curriculum to enhance student learning outcomes through experiences not based solely on a "lab." Video Editing: An essential skill needed to produce cogent, sensible, easily-acessible communication through the production of video projects.Very much concerned with visual Literacy, and design. Visual Literacy: Understanding the grammar of cinema, photography and applying this understanding to other create or judge visual communication. Vodcasting (Podcasting): Another way to share digitally via the net. Wikis: An online sharing set-up whereby anyone can view and an administrator can assign permission for people to edit certain (or all) pages. Repository: Consider this storage of digital data for easy access. 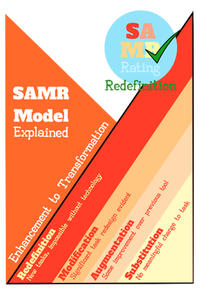 I consider this site a repository of an overview of many important aspects of digital-age learning that have been created to share and so that I can have easy access to assist me in presenting and training others. When you are in a school or and educational setting, you start speaking a secret language. You can say sentences like “The IBO wants you to do vertical articulation as a part of the backward planning sequencing for MYP to DP curriculum development in the Group 3 subjects. But make sure the summative assessments are differentiated for the ESOL students and the criterion are modified since this is a year 3 of the program.” If that made sense to you, you may be a teacher. If it didn’t, you are normal. The military has nothing on teachers for the overuse of acronyms and coded vocabulary. In this section, I will try to provide translations for edu-speak. I’ll try to provide links or resources that are helpful. Other may add their ideas. This will evolve as I write and find myself slipping into the secret language of teachers. But a lot of the definitions are my own understanding and may show my own bias. Take what I say with a grain of salt.1:1= One Computer for One Student. This is the common term for when a school provides a computer for every kid. My school is implementing this for grades 6-12 August 2011. IBO = International Baccalaureate Organization. An educational organization that helps teachers develop curriculum grades 1-12. Way more to write here, but this will work as a start. PYP = Primary Years Program. My addition to this section: grades 1-5, but with a strong focus on inquiry (consider this discovery) based learning. MYP = Middle Years Program. Also developed by the International Baccalaureate. Usually grades 6-10. Less scripted than the DP. Very project based, cross-curricular, student centered. DP = Diploma Program. It’s the pre-college curriculum developed by International Baccalaureate. Grades 11-12, exam based. For the Americans, its kind of like AP (but different). Assessment: This is a fancy word for the work students do. It can be small or large, but it’s a way to figure what a student understands. Summative Assessment: This is complicated. If you ask a student they would probably say this is the work that gets a grade. And every time a teacher hears this, it’s like hearing fingernails on a blackboard. It’s the projects, tests, essays, that show an understanding of the major concepts/skills/knowledge of a student. Formal feedback is almost always given with summative assessments. Formative Assessment. This is complicated. If you ask a student they would probably say this is the work that doesn’t get a grade. And every time a teacher hears this, it’s like hearing fingernails on a blackboard. This is the practice and the work that leads up to the major products. It can be a draft. It can be practice. It can be homework. Feedback may be more informal than in a summative assessment. Unit/Unit of Study/Unit Question: For each of my classes I teach about 4-6 units per year. These are the big topics of study. They are usually based around an open-ended unit question that frames our class discussion/assessments for the 6-8 weeks we study. Vertical Planning: Thoughtful planning the skills and content knowledge needed for success in a humanities (or whatever subject) from grades 9-12 or 6-12. Really great vertical planning would keep in mind grades 1-12.